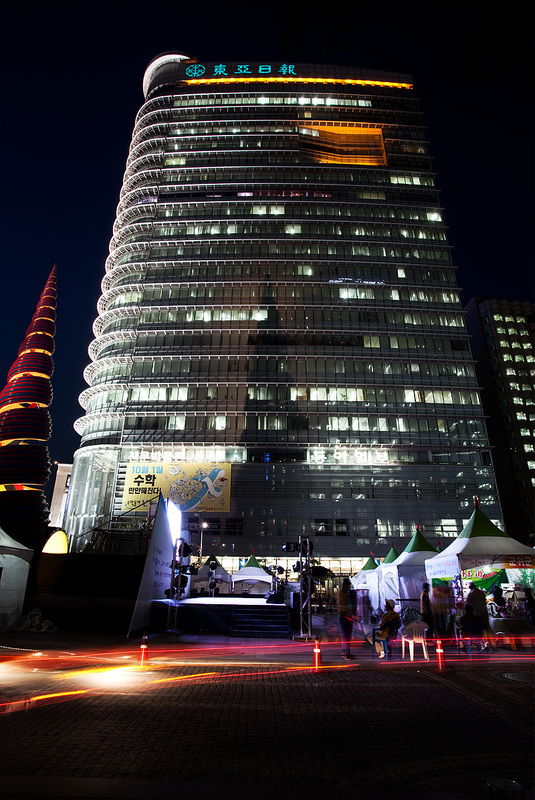 A beautifully illuminated building at the head of the man-made Cheonggyecheon (청계천) stream. I can pretend to have seen and deliberately captured the cone's shadow on the building but that would be a filthy lie. Instead, I was far more concerned with waiting for a car going the correct speed to create a light trail that would fill the entire width of the frame. In case you're curious, I believe the tents were set up for some fruit festival or perhaps some type of evening farmers' market. I'm illiterate so you'll have to bear with me as I struggle to decipher simple Korean texts.